More Nostalgia: Honda ATC 250R – The Devil’s Own ATV. Yes, Please. As I said last week, I’m a motorbike addict. It’s Friday afternoon – I must be lusting after motorcycles I don’t need. 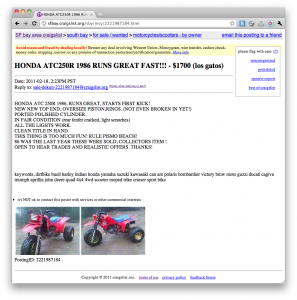 Today during my afternoon browsing-for-bikes-on-Craigslist coffee break, I came up a 1986 Honda ATC 250R. ATC as in all-terrain cycle. As a kid, I rode all kinds of motorcycles ranging from late-sixties, barely-ridable suicide machines to newer, sweeter machines. We had several three-wheelers, and the pinnacle of awesomeness was my 1983 ATC250R. It was brutally, unforgivingly fast – and therefore incredibly fun. Kids these days on their gently-tuned, softly-suspended four-stroke ATVs have no idea of the fury you unleash when you whack the throttle open on a two-stroke screamer. I remember cackling maniacally inside my helmet every time I hit the gas, front wheel pawing the sky, arms stretching as I struggled just to stay on the bike. I was 13, and felt like I was riding a rocket ship. This guy’s ad title sounds like me back then, breathless, all-caps screaming, “RUNS GREAT FAST!! !” He’s not joking – this is a crazy-fast machine, a “nasty little bugger” like HST wrote about in Song of the Sausage Creature. To paraphrase, “There are some things nobody needs in this world, and a bright-red, warp-speed 250cc two-stroke ATC is one of them – but I want one anyway, and on some days I actually believe I need one.” Rule Pismo Beach, indeed. I always lusted after the ’86 ATC250R. It was the last – and greatest – of the three-wheeled Mohicans, due to a ban on three-wheeled all-terrain vehicles. They occasionally turn up on Craigslist, and I immediately fire up my daydream machine. “What I need is a little truck and this here ATC, and I’ll spend my weekends roosting the dunes!” Never mind the last time I rode an ATV up at Prairie City a few years ago, I ate it hard on some river rock and couldn’t walk upright for about a month. I never really felt comfortable on four-wheeled ATVs, though. I’m pretty sure three wheels are safer, no worries.